Ultimately stock prices are driven by earnings. 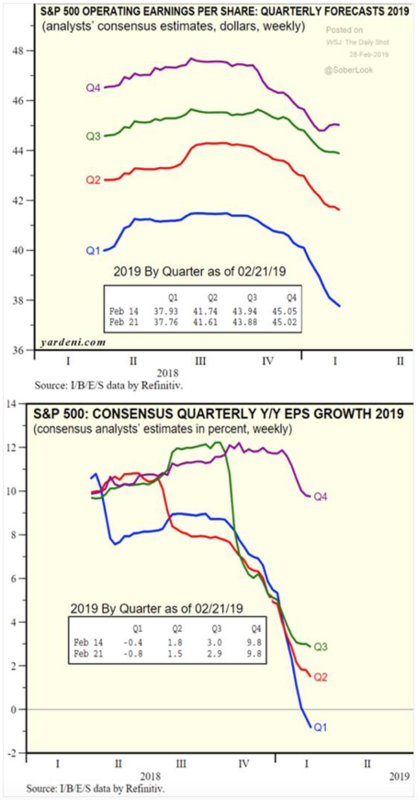 Stock analysts have been downgrading 2019 estimates on company operating earnings (see the charts below), which is a clear warning that the markets this year will become increasingly treacherous. But why hasn’t the market done worse? 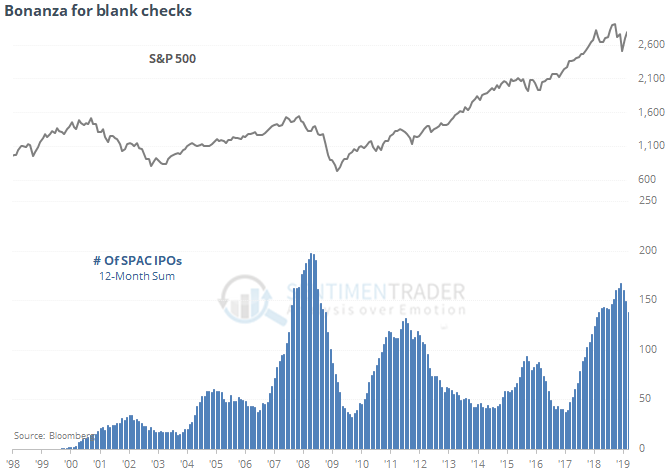 In fact, there has been a growing consensus that recent market support and surges have been propelled not so much by investors, but rather by companies buying back their own stock. 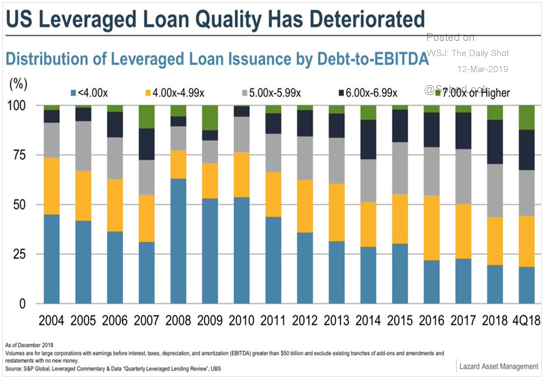 Earnings decreases and slowing growth also mean companies should become increasingly unwilling to tap excess cash or use debt to execute buybacks. This means even more trouble ahead for the stock market. The following commentary and Chart are from our friend Jason Goepfert of SentimenTrader.com. The Wall Street Journal noted that there was a surge in blank-check IPOs last year. These are open-ended stock market securities where investors give money to the operators to basically do whatever they want. We only see demand for these securities during periods in the market of extreme risk appetite. A rolling 12-month sum of these stock market IPOs is only now starting to curl lower. Shifting tides in the ETF Market? The following commentary and Charts are from our friend Kevin Duffy of Bearing Asset Management, LLC. Whether or not this is the start of a trend, it’s worth keeping an eye on. 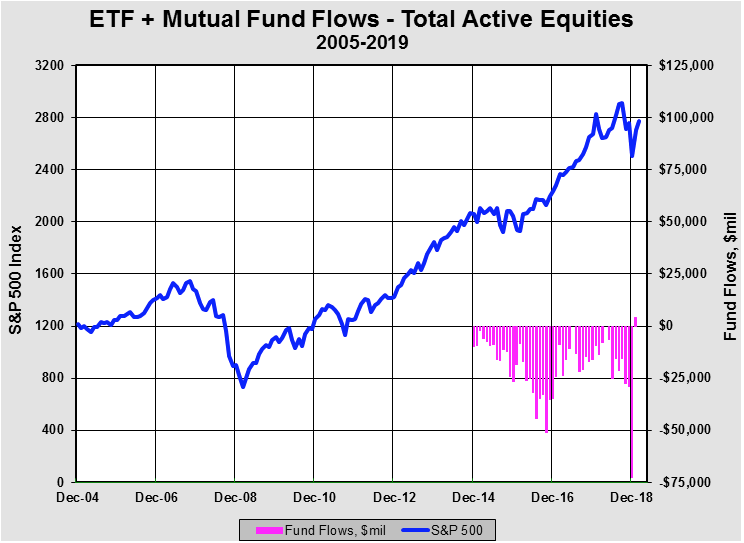 I believe Dec-18 marked a capitulation of sorts out of active investing ($72.6B outflows) into passive investing ($55.8B inflows). The stars now appear aligned for a long run of outperformance by active managers – trillion dollar mega cap tech valuations, financial engineering at large companies, destructive p.c. policies at large companies, a wave of disruption (FAANG companies spent a combined $100B last year on R&D), and changing consumer tastes of millennials. A bear market could also tip the scales. January’s biggest surprise may have been the relative flows for active and passive U.S. equity funds. Passive funds fared worse than their active counterparts for the first time since January 2014. U.S. equity funds had modest outflows of $3.8 billion overall, despite the S&P 500 gaining 8% (the index’s best January since 1987). 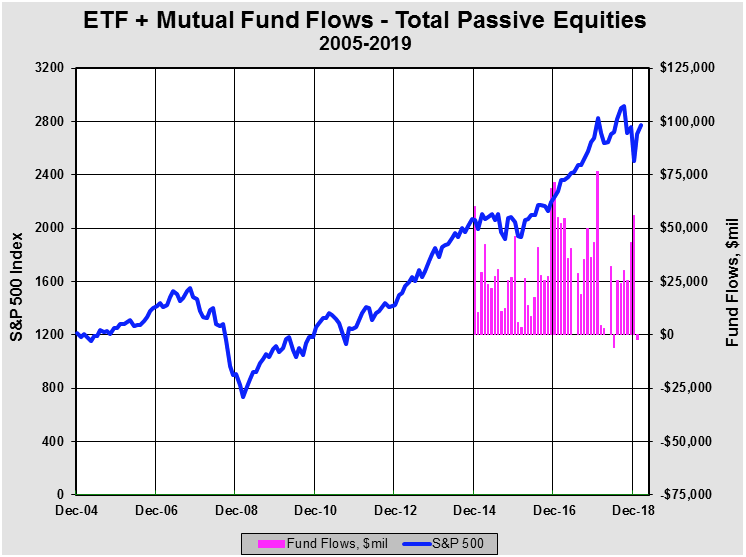 On balance, these outflows came from passive U.S. equity funds, while active flows were flat. This week’s Chart of the Week comes from our friend Kevin Duffy of Bearing Asset Management, LLC. 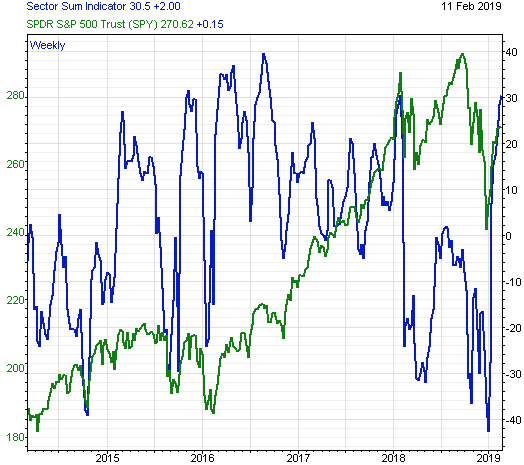 The proprietary Investor Intelligence Sector Sum Indicator measures how overbought or oversold the equity markets are by analyzing the number of bull trends among the 45 major industry groups. The indicator ranges from +40, overbought, to -40, oversold. As you can see from the chart below, the indicator in a relatively short period of time has climbed to the present overbought +30 from an extremely oversold -40 at year end around the time the market rallied. That quick move from oversold to overbought is a clear warning for investors to lighten their portfolios. It also is another indication of how volatile the markets have become.